With the natural gas industry booming, critical supplies can be in short supply. In recent days, new orders for Barton orifice meters have had a backlog of many weeks. For many, that's simply an unacceptable delay. 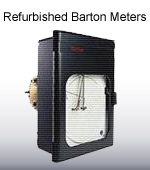 Refurbished Barton meters are available from R L Laughlin to meet this very need. You'll get them when you need them, and at a better price. Call 304-776-7740 for more information.